Three custom profiles with infinite possibilities. 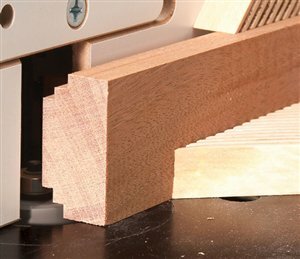 Your router table is the perfect tool for making an almost limitless variety of picture frames. The problem is that with so many router bits and possible combinations of bits, where do you start? The three picture-frame profiles in this article are a good beginning. 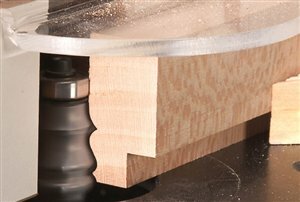 With the exception of the final profile, all use common router bits. Each frame illustrates a basic technique; use them as springboards for your own unique creations. 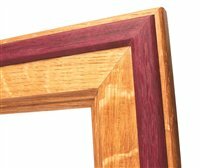 This mahogany picture frame is no two-bit design. The complete profile is made with a single 3/8-in. rabbeting bit, a single fence setting and a single depth-of-cut setting. There’s no fussing around. 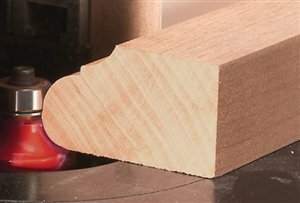 Repeating a router-bit cut on both sides of a piece of wood or changing the depth of the cut is an easy way to create unique profiles. 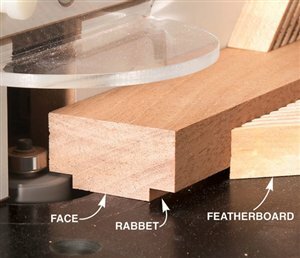 Try using different router-bit profiles for other custom frames. 1. 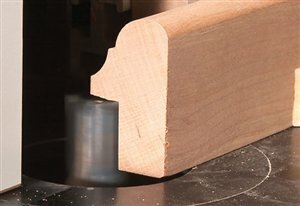 Make the first two cuts with the stock face down on the table. Set the fence flush with the bearing and raise the bit to cut a 1/8-in. x 3/8-in. rabbet. 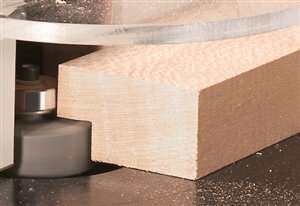 Featherboards guarantee smooth, straight cuts. 2. Make the second two cuts with the stock on edge. The fence and bit-height settings remain the same. 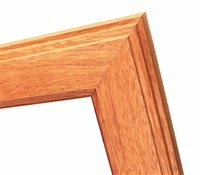 Make this frame profile using three standard router bits: a 1/4-in. 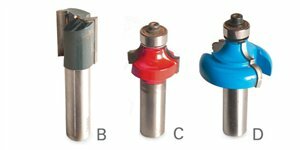 round-over bit, a classic ogee bit and a 3/4-in. straight bit. Rout all the pieces, glue the inlay and then cut the miters. I like to use contrasting woods, in this case, riftsawn white oak with a purpleheart inlay. 2. Rout the roundover on the outside edge of the frame stock. 3. Plow the inlay groove next to the rounded edge. 4. 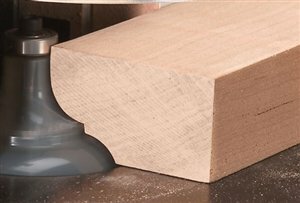 Cut the inside edge profile using a classic ogee bit. Cut the back edge profile by dropping the bit to half height. Move the fence forward to cut half the bit’s depth. 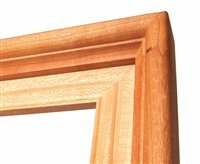 Two-part (or even three- or four-part) frames are a great way to create deep, eye-catching picture frames beefy enough for a big landscape painting but capable of holding even a small family photo.I built this frame with cherry on the outside and quartersawn sycamore in the inside. Make the inner frame first, cutting the usual 3/8-in. 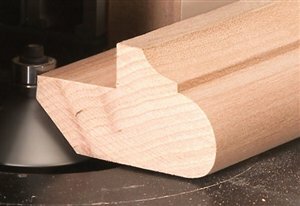 rabbet (Photo 1) and then routing the profile on the face (Photo 2). Then machine the outside frame (Photos 3 through 6). Miter and glue the inner frame; then cut the outer frame to fit. Tack the frames together with a few brad nails. 1. On the inner frame, cut the rabbet to house the matte board, glass and artwork. 2. Add a distinctive profile to the face of the inner frame using a specialized picture-frame molding bit. 3. The outer frame gets an ogee profile. I used a specialized bit that creates an extra-large roundover. 4. Complete the rounded edge by flipping the board and routing a roundover on the ogee’s opposite side. 5. Use a straight bit to cut a rabbet to house the inner frame. 6. Chamfer the back edge to lift the frame off the wall and make the frame appear less massive. Amana Tools from ToolsToday.com, 888-699-3939, www.toolstoday.com 3/8-in. rabbeting bit with 1/4-in. shank, #49300; with 1/2-in. shank, #49302; Chamfer bit with 1/4-in. shank, #49400; with 1/2-in. shank, #49402. MLCS, mlcswoodworking.com, 800-533-9298, 3/4-in. straight bit, #5455 1/4-in. shank; #7755 1/2-in. shank; Picture-frame ogee bit with 1/2-in. shank only, #8622; Picture-frame molding bit with 1/4-in. shank, #6321; with 1/2-in. shank, #8621. Freud Tools from Seven Corners Hardware, 7corners.com, 651-224-4859, 1/4-in. round-over bit with 1/4-in. shank, #34-110; with 1/2-in. shank, #34-120. Rockler, rockler.com, 800-279-4441, Classic ogee bit with 1/4-in. shank, #91666; with 1/2-in. shank, #91673. 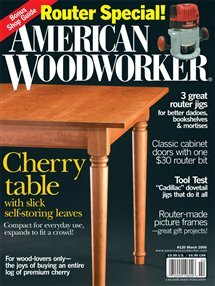 This story originally appeared in American Woodworker March 2006, issue #120. 2018 Anarchist’s Gift Guide, Day 4: Wait, am I an IKEA Shill?